These flowers are so special, once you've tried them you'll know why! 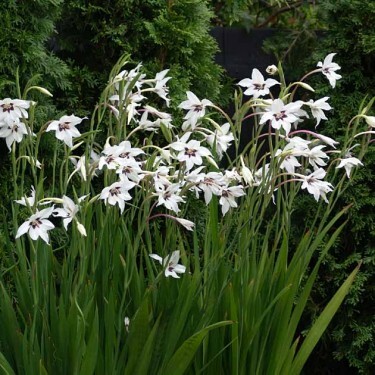 One of our most popular summer blooming unusuals, Acidanthera is a fragrant bloomer that produces delicate, star-shaped white flowers that have a distinct chocolate brown blotch. Native to Ethiopia, Acidantheras are close relatives to the gladiolus. Sending up tall spikes that bear delightfully scented flowers that open in sequence from the bottom of each spike. Plant them in clusters for best effect and be sure to plant them along borders or close to the house where you can take full advantage of their fragrance. Acidanthera bicolour murielae can be left in the ground for zones 7-11. In zones 6-3 the corms should be dug up in the fall and stored until the following spring in a frost free place. 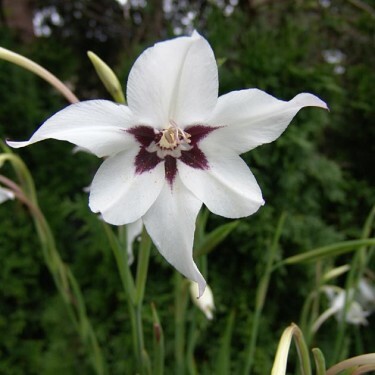 Watch the Botanus Garden Club video about Late Bloomers including Acidanthera bicolor murielae!